It’s never been easier to start a business than now. Moreover, as technology has become more accessible, you don’t need to be a technologist to start a tech business either. During Spark Festival this year, we were lucky to hear from three brilliant, Indigenous entrepreneurs with non-technical backgrounds about their startup experiences. These three entrepreneurs are using technology to support and advance their communities, from storytelling through augmented reality to a pitch platform to surface and fund ideas from Indigenous communities. Meet Mikaela Jade, Jocelyn King and Melissa Lacey. Melissa Lacey is the co-founder of Point River Networks, a company committed to developing capabilities and providing opportunities for Indigenous people to work and engage with technology, business and government. Jocelyn King is the CEO of First Australians Capital, with a mission is to invest in Indigenous economic independence by linking 60,000+ years of Indigenous business experience with the modern marketplace. Mikaela Jade is a SheStarts advisor and the Founder & CEO of Indigital, with an app that empowers people to learn more about the traditional stories and cultural significance of the land through augmented reality. Where did the seed of inspiration plant for these entrepreneurs? Driven by her passion to give back to the community and create opportunities through cadetships and traineeships, Melissa co-founded Point River Networks with her friend Sally, whom she met during a maternity meeting at the gym. “Having the Indigenous Procurement Policy come out and having support from Supply Nation, I really thought I could do this with Sally,” she said. I’m passionate about giving other Indigenous people the same opportunities I was provided with. With an extensive background in consulting and Indigenous economic development, Jocelyn was compelled to start First Australians Capital as a means to support Aboriginal economic development. As for Mikaela, a chance encounter with augmented reality at the University of Canberra was the spark behind Indigital. This is what Mikaela did next. She applied for and secured an Innovation Connect grant from the ACT government and her startup journey began. As Jocelyn, Melissa and Mikaela shared their experiences, their desire to support and celebrate their communities and culture was powerful. The startup journey is a challenging one – even more so when you launch your business from a remote area like Kakadu, as Mikaela did. “I took a really really long time to work out how to get the technology to work in a remote area with no internet. We did it though – and part of that really expanded my mind to the other possibilities for Indigenous people using technology,” she said. We can’t just sit back and wait for the internet to get to our communities. We need to get into these communities and work with people to help amplify through self determination, what they want to do with technology and how it can help them. These are not bedtime stories, they are really important instructions for living on planet earth sustainably. Jocelyn also realised the power of using technology as an enabling mechanism to grow and empower others to start their own businesses. “We’re currently building a pitch platform which will enable Indigenous entrepreneurs to pitch their business ideas using their mobile phone and crowdfund loans from mum and dad investors right through to social impact investors,” she said. I think it’s really important that there’s opportunities for all Indigenous women to dream. 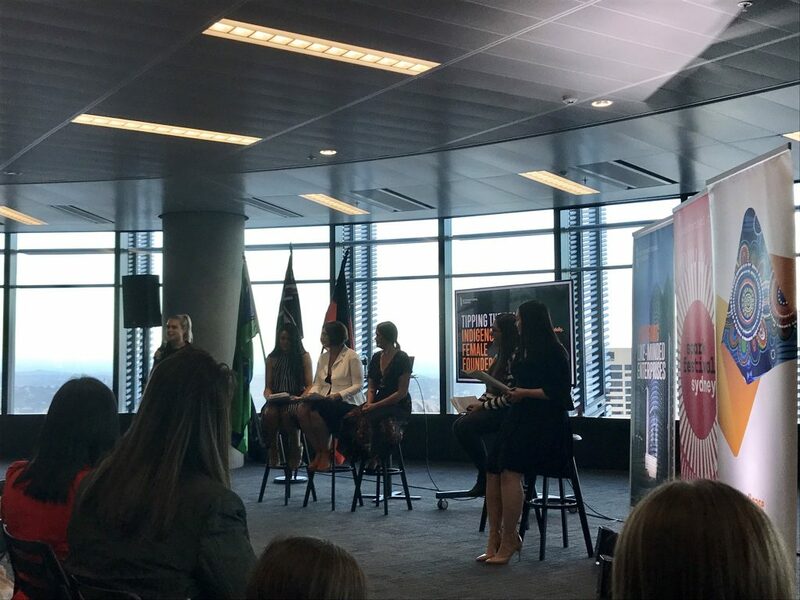 Inspiring – Melissa Lacey, Jocelyn King and Mikaela Jade shared their experiences during Spark Festival. We left the event inspired, blown away by the passion and grit of these entrepreneurs who are redefining what it means to be a tech entrepreneur. It’s important that we keep sharing and shining a spotlight on these stories – with our communities and through great programs like Spark Festival, which bring together ideas and founders from all walks of life together for conversations. At SheStarts, we’re committed to turbocharging female leadership in tech and innovation. We want to find, fund and accelerate ambitious women ready to kick-start their bold ideas – and share their stories with the world, to inspire other women and girls to get started.